In case you haven't seen our official Infatuation review for the original location, allow us to get you up to speed: We've got a lot of love for The Meatball Shop. Every once in a while, we forget why we like this place so much. But being that these things are f*cking everywhere now, opportunities constantly present themselves to remind us of how reliable this restaurant is. The Meatball Shop's balls are pretty damn impressive, whether it be on a bun or naked for the world to see. We also like the fact that they bump hip hop through the speakers, serve homemade ice cream sandwiches, and take their beer and wine list more seriously than you might expect. This is basically the Italian Shake Shack. Or maybe it's the Uber of meatballs. Or Warby Parker for sandwiches. Jesus, we've been spending too much time in San Francisco. 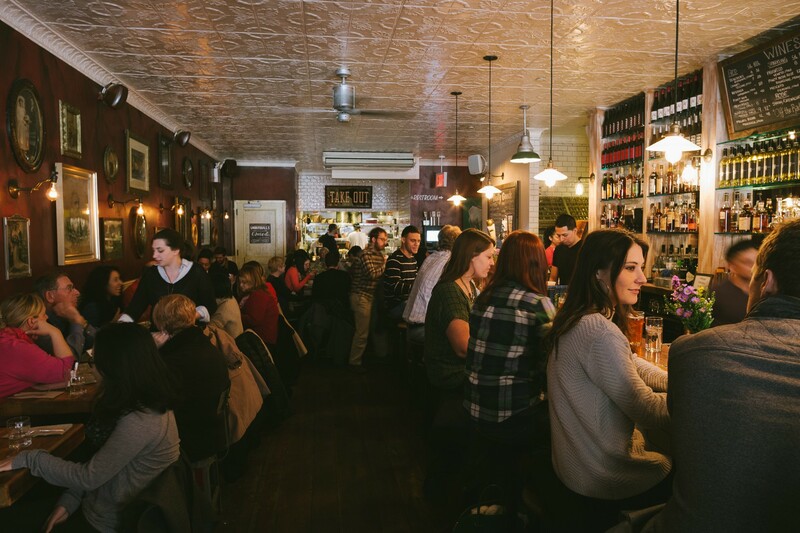 Of all The Meatball Shop locations, Chelsea is our favorite. It's spacious, has a great private room downstairs for big group outings, and is open until 2AM. It's also in a neighborhood that's rich with quality humans, but not necessarily quality restaurants. As a result, The Meatball Shop operates at capacity on most nights. Can't deal with the crowds? Try it for takeout. Either way, this is a good spot to have in your back pocket for the next time you need an easy meal in the neighborhood. We'll kick this off by tackling the meatballs on their own. The spicy pork is by far the best,followed by the beef and the lamb (if available as a special), followed by the vegetable, which are surprisingly tasty. The chicken meatballs are whatever.They are all relatively light, though eat too many and you will feel it in your gut for a day at least (trust us). While nice on their own, these meatballs are best showcased in a sandwich, rather than simply in sauce or atop a bowl of pasta. That being said, both the spaghetti and and rigatoni they serve at TMS are simple and solid. Served on a baguette with your choice of ball, sauce, cheese, and bread type. Our favorite is spicy pork, spicy meat sauce, and provolone on whole wheat. Add an egg if you're feeling crazy. It's quite possibly the perfect meatball sandwich. Two meatballs served on a brioche bun. A bit smaller than the hero with the same options, and also very good. We always get an egg on top. A nice way to sample the goods, we absolutely love the special lamb meatball with mushroom sauce. The chicken with parmesan cream sauce is a let down. For $3 a pop, your money is better spent diving into a bigger sandwich. Get a hero. Buttery, creamy, mashed potatoes with bits of skin. Rich and perfect, just don't fill up on it. Not in the mood for a big ball sandwich? The kitchen sink salad is what the doctor ordered,featuring some greens, some vegetables, and some balls. Significantly better than whatever salad you just ate for lunch. Order one of these or risk wasting the best years of your life knowing only the Chipwich.